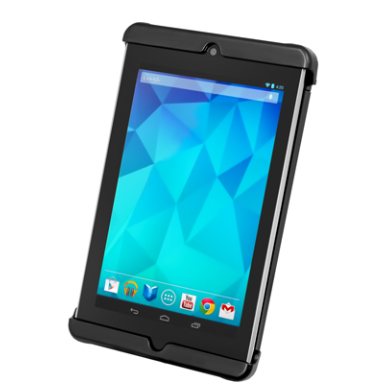 The RAM-HOL-TAB18U RAM Tab-Tite™ Universal Cradle for Google Nexus 7 from the RAM iPad & Tablet Mounts range is made of custom support cups and a spring loaded back plate that is specifically shaped for the Google Nexus 7, both with and without a light-duty sleeve. It is built with a special spring-loaded design that makes it simple and quick to insert and remove the tablet while keeping it secure. The cups allow you to retain full access to all ports of your device.